The Nigeria Football Federation was at the forefront of the organization as top Nigeria Professional Football League Clubs, Lobi Stars and Nasarawa United played a charity match on Wednesday in Makurdi, in honour of victims of the recent flood that displaced scores of thousands of people in the Benue State capital. Chairman of the NFF Media and Publicity Committee, Hon. Suleiman Yahaya-Kwande (a ranking member of Nigeria’s House of Representatives), Alhaji Yusuf Ahmed Fresh (Chairman of the NFF Referees Committee) and Alhaji Mohammed Alkali (Independent Chairman of the Nationwide League One) played important roles in organization and were fully on ground for the match itself. The day began with a courtesy call on the Executive Governor of Benue State, His Excellency Samuel Ortom, who was obviously delighted to receive so many leading football stakeholders at the Government House, Makurdi. “I am really impressed by this gesture from the Nigerian Football family. We are encouraged by your support and I want to assure you that the Government of Benue State will continue to give Lobi Stars FC all the support to participate credibly in national competitions. Also present were Barrister Isaac Danladi (Chairman of Nasarawa United Football Club and Chairman of NPFL Club Owners); who represented the 20 Nigeria Professional Football League clubs, Mr. Alloy Chukwuemeka (Executive Secretary of the NPFL Club Owners) who represented LMC Chairman Shehu Dikko; Mr. Jude Anyadufu (General Manager of Enyimba Football Club) and the Vice Chairman of Lobi Stars FC, Mr. Mike Idoko. 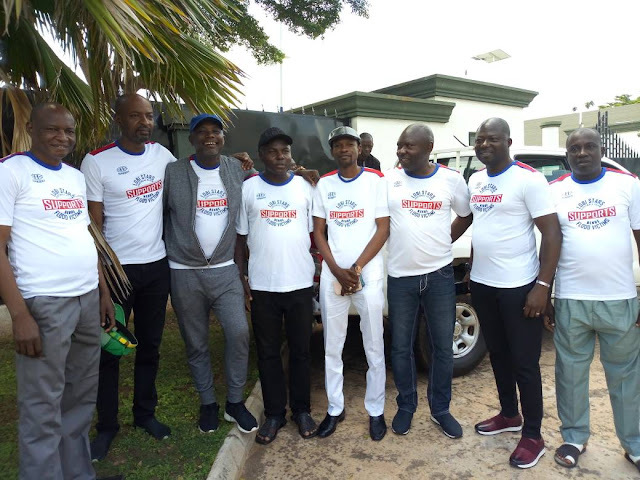 After the visit to the Governor, Yahaya-Kwande, also a ranking member of the NFF Board and who represented NFF President Amaju Pinnick, led the football stakeholders to donate food items and balls to children of some identified victims of the flood. Proceeds from gate –takings for the match will go to inhabitants of the affected areas who have now been displaced from their homes.